First it was the Washington Capitals lifting the Stanley Cup back in June, and then it was Walsh, Colucci, Lubeley & Walsh’s mushball team lifting The Mushball Cup in September. 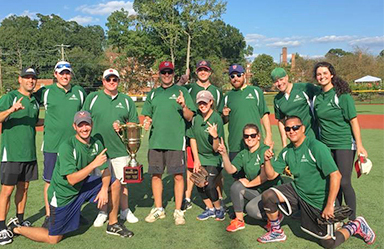 The LandLawyers, a team of 12, representing Walsh, Colucci, Lubeley & Walsh’s and consisting of Firm employees and spouses, won the second annual Real Estate Mushball Classic on September 29th. The Real Estate Mushball Classic is a tournament hosted by the Nationals Youth Baseball Academy which is open to organizations that are members of the Washington D.C. area real estate community. This year’s field consisted of twelve highly competitive teams, and the LandLawyers’s path to victory required three wins in the group stage, as well as two wins in a four team playoff. Mushball is similar to softball and is played with similar rules, but the ball is softer and lighter. This means that home runs are generally harder to come by, and playing as a cohesive team is imperative. 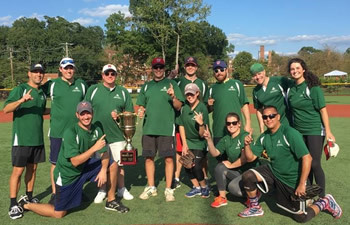 Under the leadership of team manager, Mark Goetzman, the LandLawyers were able to successfully turn their off-the-field teamwork and comradery into on-the-field success by working together as a strong, collaborative and communicative team committed to playing error-free Mushball. This was not the LandLawyers’s first foray into the world of competitive Mushball. The LandLawyers have supported the Nationals Youth Baseball Academy by participating in the past three Legal Mushball Classic tournaments, and making it to the championship game in two of those tournaments along the way. These past experiences, coupled with the opportunity to support a wonderful organization, made the LandLawyers’s victory all the more enjoyable and meaningful. Funds raised in connection with the various Mushball tournaments go towards furthering the mission of the Nationals Youth Academy, to use the sports of baseball and softball to foster positive character development, academic achievement and improved health among youth from underserved communities in Washington, D.C. If you are in our Arlington office in the coming weeks, we encourage you to take a moment to admire the Mushball Cup, which will be proudly on display in the lobby, and to send a special congratulations to the LandLawyers team members, and Walsh Colucci employees, Mark Goetzman, Brian Prater, Bob Brant, Matt Westover, Antonia Miller, Mike Romeo, Phil Dales, Ed Encarnacion and Caroline Herre. (Note to readers: at time of this publication plans for a ticker tape parade celebrating the team’s victory are still to be determined).